11 Thompson St. N. Y. The Alexanders were William Joseph Alexander (1841-?) and Charles Curtis Alexander (1842-1919). They succeeded their father, William Alexander (1802-1862), who began the business in the late 1830s. New York city directories list William Alexander, blacksmith, at 98 Grand St. from 1838 to 1851, then at 48-50 Wooster St. from 1852 to 1863. In 1864 the business was renamed W. J. & C. C. Alexander. They stayed at 48-50 Wooster St. through 1883, then moved to 3 York St. where they stayed until 1901. From 1901 to 1916 they were located at 11 Thompson St.
"William Joseph Alexander, eldest son of William and Lucinda (Sarles) Alexander, was born at the family home, No. 551 Broome street, New York, July 5, 1841. His education was acquired in the schools of his native city, and later he entered the employ of his father as an apprentice, and in due course of time became proficient in the iron working business. Upon the death of his father he entered into partnership with his brother, Charles C. Alexander, and together they have successfully continued this business for forty-four years." This is quoted from Historic Homes and Institutions and Genealogical and Family History of New York, vol. 3, 1907, by William Smith Pelletreau. This history continues, "The business is one of the oldest in the city of New York, it having been established by his father, William Alexander, in 1836... Charles Curtis Alexander, second son of William and Lucinda (Sarles) Alexander, was born at the family home, No. 551 Broome street, New York, December 25, 1842... He has been connected with the General Society of Mechanics and Tradesmen for eighteen years, and is chairman of the purchasing committee for that library." Regarding the Alexanders' iron business, Pelletreau writes, "After leaving school the two sons of William Alexander learned the trade of iron manufacturing with their father, and were instructed in all the details of the business, at No. 98 Grand street. At that time almost everything was done by hand, and they made all the various kinds of iron work that was then used in buildings. The business was extensive and gave employment to a large number of men. The establishment to which they succeeded was originally carried on by Mr. Paulus Hedl, a monument of whose skill may be seen in the iron stairs and railing in the City Hall. The material made by the Alexanders entered a great many buildings in the lower part of the city. At that time there was but few other establishments of the kind. When Mr. William Alexander learned his trade there were with him as fellow apprentices J. B. and W. W. Cornell, George R. Jackson and Michael Gross, all of whom have made large fortunes from establishments of their own." William J. Alexander and Charles C. Alexander were descendants of Captain Charles Alexander, one of the earliest officers in the American navy. His exploits in the American Revolution are recounted in Historic Homes and Institutions and Genealogical and Family History of New York cited above. Another W. J. 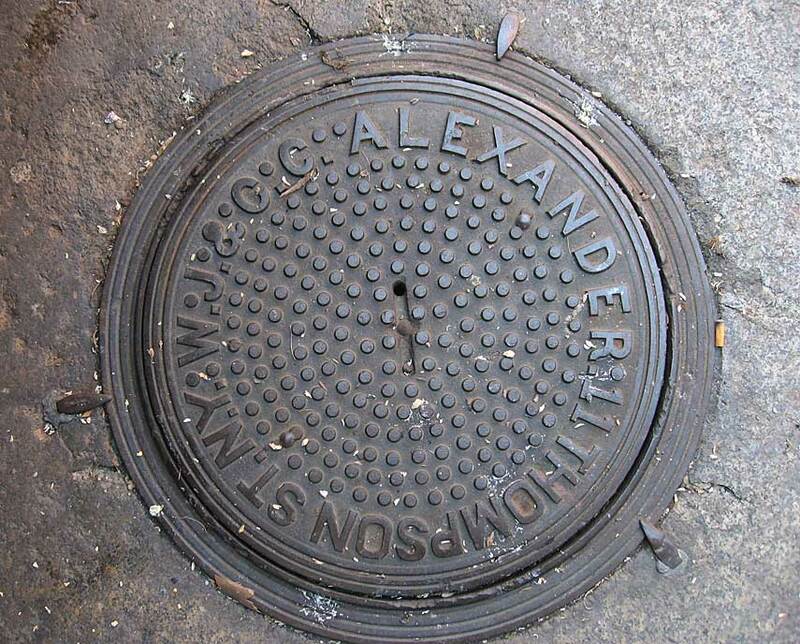 & C. C. Alexander coal chute cover is found on East 12th St. This one carries an earlier address, 3 York St. The W. J. & C. C. Alexander Iron Foundry was located at 3 York St., Manhattan, from 1884 to 1901. York St. is a one-block street that runs east from St. John's Lane to 6th Ave., a block south of Canal St. in Manhattan. This advertisement for W. J. & C. C. Alexander in 1900 located York St. as near West Broadway and Canal. In 1900 6th Ave. terminated at Bleecker St. So the next street east from St. John's Lane at that time would have been West Broadway. The 1850 U. S. Census recorded William Alexander, age 45, born New York, Blacksmith, living in New York's 8th Ward. With him are Lucinda, 37, his wife, and the children, William, age 8, and Charles C., age 7. Ellen Sarles, 66, presumably Lucinda's mother, was also part of the family. In 1864 IRS assessed Wm. J. Alexander and Chas. C. Alexander $24.79 each as the beneficiaries of the estate of William Alexander at 16 Watts St. The two sons each received $3279 inheritance. Lucinda Alexander was administratrix. The 1880 U. S. Census recorded both William and Charles Alexander living in New York. Their occupations were "Iron Railing" and "Ornamental Iron Works." In both the 1900 and 1910 census reports William Alexander lived in Hasbrouck Heights, New Jersey, and Charles Alexander lived on Greene Ave., Brooklyn. On his death, 15 March 1919, the General Society of Mechanics and Tradesmen of the City of New York announced "the death of Brother Charles C. Alexander ... for thirty-one years a member of the society, serving faithfully for twenty-six consecutive years on the Library Committee." The Alexanders were also manufacturers of cast-iron for buildings. An example of their foundry mark is found at 124 Chambers St.